As the UK races towards the trigger date in March 2019 for article 50, both the short and long-term impacts of Brexit are still being digested and proselytised over by citizens and politicians alike. 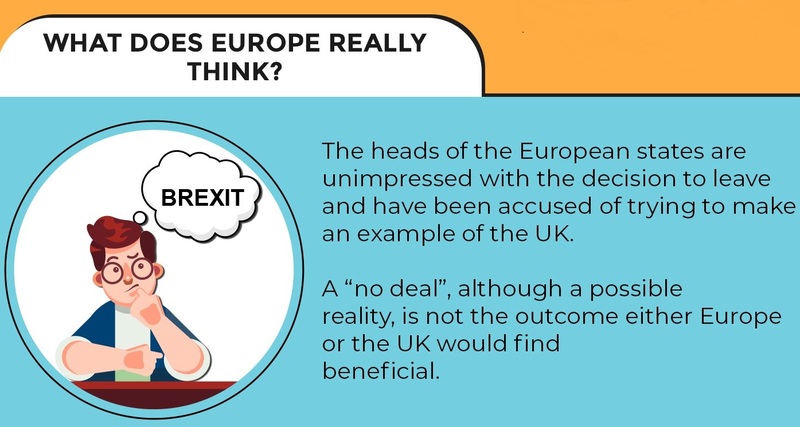 The initial stages of the Brexit debate focused on the terms “Hard” or “Soft” Brexit, but what do those terms really denote? As a member state of the European Union Britain receives the benefits of access to the Single Market, Customs Union and the European Court of justice. The leave camp is accusing the International Monetary Fund and The Europe Union of scaremongering, whilst the remainers are pointing to an imminent economic downturn as the motive and reason to appeal for a second public vote. A hard Brexit would see Britain lose their entitlement to these benefits and create a much more complete separation from the European Union. This Hard-line approach is favoured by more staunchly Conservative politicians claiming that a it is more representative of the will of the people. The soft Brexit approach would fundamentally ensure that not much changes and Britain would still be bound by the Majority of EU regulations, but this doesn’t sit well with hard liners who see it as a betrayal of National Democracy. Under the current plans for a strategic Brexit by the government, this riddle doesn’t appear to be solved. But the Chequers deal, with the proposal to create a common rule book with the EU seems to fit somewhere between the two. There would be no need to impose tariffs or create delays at the border, but it would allow the UK to negotiate trade deals independent of Europe with countries such as China and the USA. The larger threat of a “no deal” makes forecasting the possible impacts on the UK economy much more unpredictable. Mark Carney the Governor of the Bank of England recently gave a Speech at the Central Bank of Ireland warning that a “no deal” Brexit does not necessarily mean an interest rate fall, but instead may cause interest rates to rise in order to combat a tumble in the exchange rate and increased borrowing demands. As for the government themselves, they suggest a failure to reach a free-trade deal could lead to a decrease of up to 8 percent of GDP. This figure is based on the probability of weaker trade and a reduction in productivity as trade would no longer be possible with Britain’s closest commercially viable customers and consumers. As long as some form of exit deal is reached, there will be a transition period from March 2019 into December 2020 where much will remain unchanged but will allow for a smooth exit and time for the UK to negotiate and ratify new trade deals. The European Single Market was created in 1993 to allow the free movement of goods, services, labour and capital without the imposition of restrictions or Tariffs. Over the years new countries have qualified as member states of the European Union, increasing the number of participating countries to Twenty-Seven. Depending on the type of deal that Britain walks away with, this could leave the country having to negotiate terms with each individual country, a time consuming and extremely costly exercise. Theresa May’s government hopes to reach an agreement on Free Trade with the EU by October 2018, but Britain still hasn’t come to the table with something that Europe feels it can agree upon. The Initiative for Free Trade is a self-styled private research foundation, previously a think tank implemented by Boris Johnson, who was a staunch leave campaigner. Ironically, it’s president is MEP Daniel Hannan. Promoted as a non-partisan organisation, it’s ostensibly become more of a go to mouthpiece for Conservative hard hitters to plead their case for global free trade, and it’s possible to see just what some of the members visions for free trade really consist of in previous speeches. For Remainers, it’s this category of organisation that generates huge concerns over the possible future threat to the NHS. By removing tariffs and ignoring the precautionary principle, the basic effect would be to leave the NHS vulnerable to foreign competition and pave the way for US style healthcare. The importance of a trade agreement between Britain and Europe cannot be underestimated and a “No Deal” would have an economic impact that can’t yet be fully understood. In step with the turmoil of Brexit, Britain is facing the added complications of domestic policy fallout on two fronts. Scotland looks poised to make its own play with regard to Europe as to how their import and export tariffs will play out over the coming years, and there have even been rumours of the Scottish Parliament applying for special EU membership dispensation access rights. When the UK public referendum on Brexit took place, the precarious relationship between Ireland and the British territory of Northern Ireland wasn’t really given a second thought by UK voters. Now, the question of the Northern Ireland Border with Ireland and the EU has stirred up tumultuous feelings in ways that many had hoped were a thing of the past under the Good Friday Agreement, but the construction of a hard physical border may very well open up old wounds. Brexit has already taken a toll on the exchange rate and with the looming fear of a “no deal”, Sterling has plunged to an 11-month low. 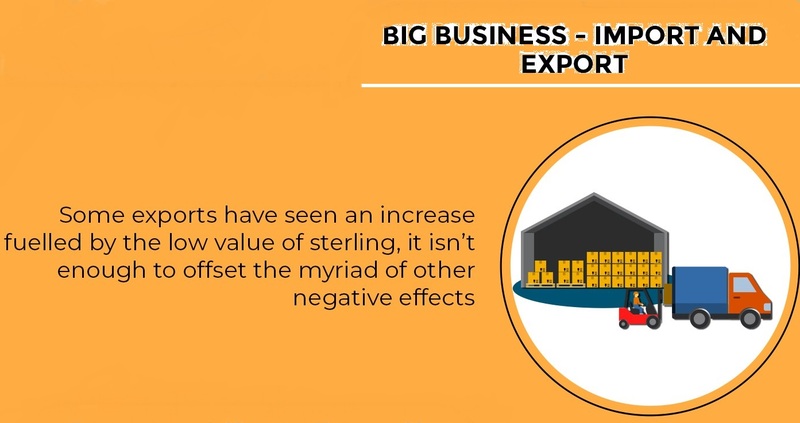 Whilst some exports have seen an increase fuelled by the low value of sterling, it isn’t enough to offset the myriad of other negative effects. UK citizens are seeing a rise in food prices and the stagnation of workers’ wages according to the London School of Economics. Amid the hubbub of outward fears, a major concern is the possible loss of jobs, with larger corporations possibly choosing to relocate to other countries where they can still take advantage of the single market and freedom of movement. A prime example can be found in the car manufacturing sector which is one of the UK’s top exports. The automotive industry is heavily reliant on being able to move parts from factory to factory within Europe, often overnight. Increased costs, time delays and added administration will make these organisations think twice in order to protect profits and ensure stability. BMW have just announced it will shut down its Oxford plant for maintenance on the day Article 50 is triggered and as a planned precaution against a “no deal” outcome. Jaguar Land Rover have been no less shy in coming forward about their fears and possible intentions as it moves its UK workforce to a three-day week. However, this hasn’t been the case for all major brands. The fashion house Chanel announced in September this year that London will become the global headquarters for its international brand, citing that “London is the most central location for our markets, uses the English language and has strong corporate governance standards with its regulatory and legal requirements”. The question is whether other globally competitive brands will feel the same. 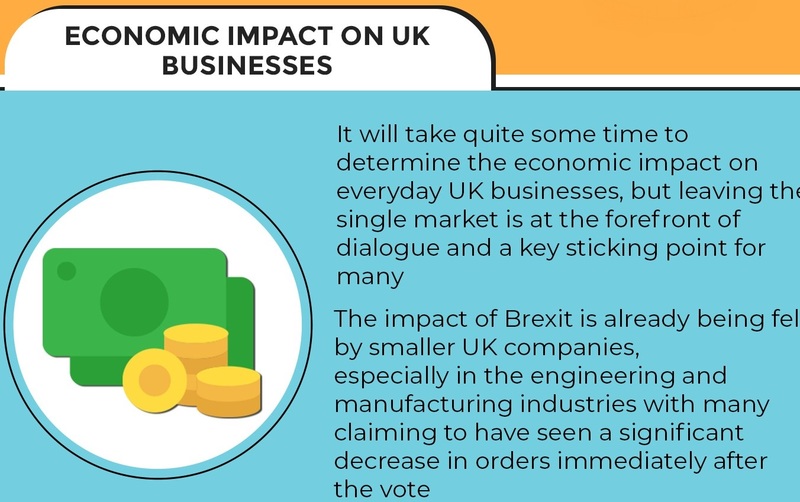 It will take quite some time to determine the economic impact on everyday UK businesses, but leaving the single market is at the forefront of dialogue and a key sticking point for many. At present UK businesses are restricted in their trade dealings with countries like Australia and Japan. 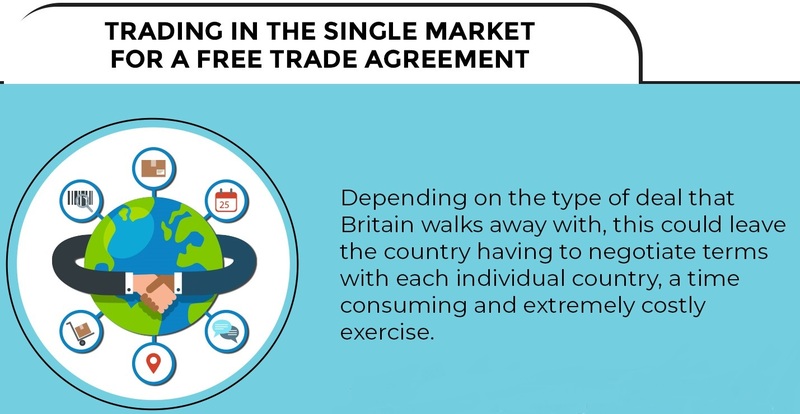 Being released from the single market will allow the UK to create its own trade deals with these individual countries instead of being tied to the EU agreements already in place. There are higher costs associated with imports of required materials and goods, however British companies producing British goods only for the UK market would be able to stave off any competition from foreign companies as they will become subject to increased tariffs. For UK companies that rely on trade with the EU, this would have the opposite affect making them susceptible and subject to increased tariffs and border controls. 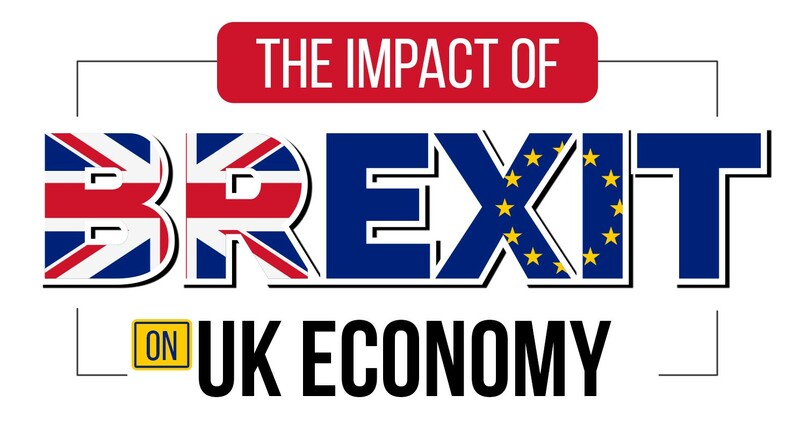 The impact of Brexit is already being felt by smaller UK companies, especially in the engineering and manufacturing industries with many claiming to have seen a significant decrease in orders immediately after the vote. The general consensus from many UK business owners in these sectors is that attitudes are already changing as they encounter an arrogance and bias against them and that emotion is not being separated from standard business dealings. European companies are already shifting their purchasing closer to home and away from the UK even though it can mean paying slightly more for goods and services. Small and medium UK companies often work closely with the Department of Trade and Industry to receive grants for projects and to encourage trade within Europe. These grants are initially given to the UKTI and DTI by the European Union and there are concerns a severe reduction in funding will see the UK become less competitive. Smaller businesses that are trying to trade in Europe feel their voices aren’t being heard by the government, even though they’re the ones bearing the brunt of the sea change in attitude. Many small business owners also express deep disenfranchisement with the UK media, who seem content on pushing a nationalistic agenda rather than a desperately needed economic one. So, what has the European Union given the UK in terms of statutory laws over the last decade? A fairly big change in the law came with the introduction of the Working Time Directive. This restricted employment rules so that no individual could be forced to work over 48 hours per week, they could opt out. The Conservative government were not in line with this proposition and opted out of this EU directive in 1992, however the Labour Government chose to opt back in again in 1998. 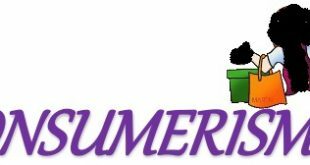 Under this particular EU directive workers receive a level of protection which could be scrapped under any new independent employment laws. The EU is able to stand above the internal politics of individual countries and create a Europe-wide level playing field for these protection rights. Minimum wage has come in for criticism from both political factions. The more leftist element alleges that it allows employers to pay the minimum wage rather than an acceptable living wage. More hard-line capitalists hold the view that by introducing a minimum wage, employers are forced to pay wages that they can’t afford or are unable to employ as many people as they need. The minimum wage is an entirely enforced directive by the European Union, although each country was permitted to set the rate of payment based on its internal economic forecasts. Under new independent rules following Brexit any future government, whether Labour or Conservative, may find itself at the behest of large organisations to repeal this right as a bargaining chip for remaining in the UK. 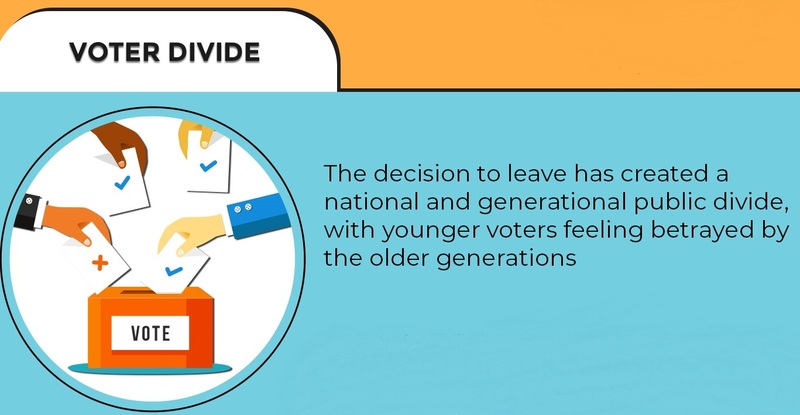 The decision to leave has created a national and generational public divide, with younger voters feeling betrayed by the older generations. According to a YouGov poll a huge percentage of voters between 18 and 24 feel Brexit is stripping them of opportunities to work and that if there is a loss of jobs to other countries, they may not be in a position to follow them. Older voters on the other hand argue they want the right for Britain to govern itself and impose its own laws and taxes rather than being blindly led by the EU. Then there is the left versus the right. Those who voted to leave are overwhelmingly of a more conservative bias than those who opted to remain. The left is accused of being drawn towards socialism and dependence on foreign nations and are prepared to give away Britain’s hard- earned money. For the more right leaning who generally consider themselves more patriotic and prouder of their British heritage, Immigration was the cornerstone of their vote. As is currently being seen in the politics of the USA, the left and right divide across the public sphere seems to be deepening and creating an inherent sense of injustice, leaving people in deep juxtaposition over their political and moral views. Immigration was a key battle ground in the Brexit vote with naysayers consistently claiming foreigners use up valuable resources from the welfare state, don’t pay taxes and refuse to integrate. From the other side we hear about diversity and how immigration only enriches UK culture. There is a question surrounding what will occur if low paid workers, traditionally of foreign origin, are no longer there to harvest the crops or carry out the more menial day to day roles in society. Brexit may well also create a shortage of foreign professionals such as Doctors, Nurses and Scientists who are dependent on visas for UK entry. Another possible ramification may be that other nationalities will view the UK as inward looking and decide to move to countries that will make them feel more welcome. 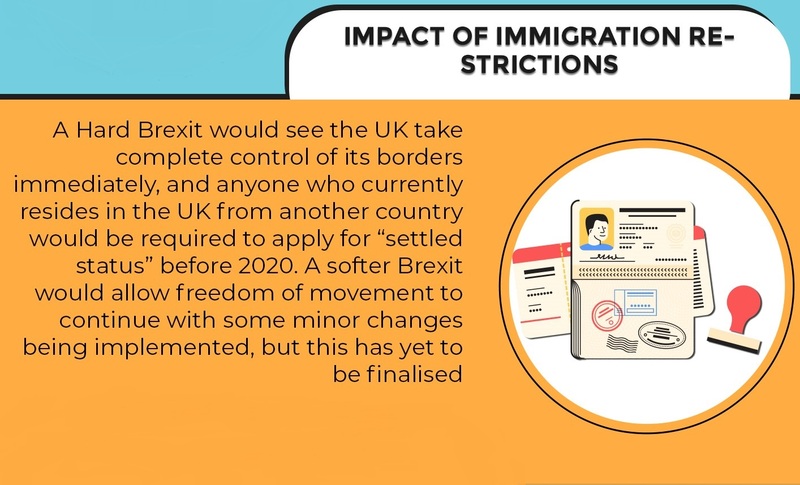 A Hard Brexit would see the UK take complete control of its borders immediately, and anyone who currently resides in the UK from another country would be required to apply for “settled status” before 2020. A softer Brexit would allow freedom of movement to continue with some minor changes being implemented, but this has yet to be finalised. There are real fears amongst elderly ex-pats living in countries like Spain that pensions will no longer be protected whilst they live abroad. Many have already been hit by the low exchange rate and the UK could see an increase in pensioners returning home, adding an increased burden on the NHS, welfare state and housing markets. 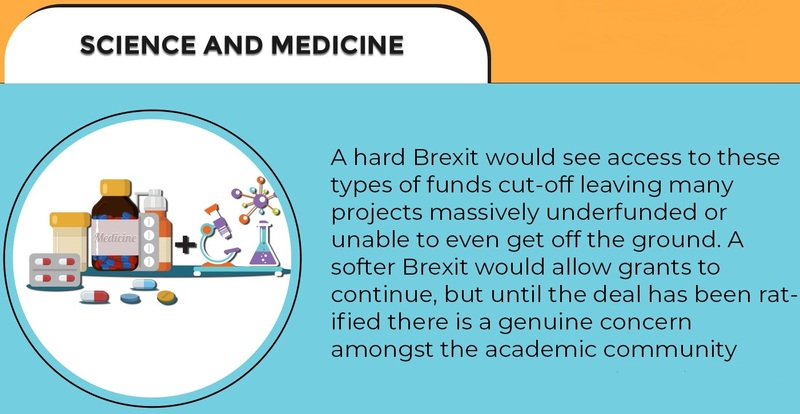 Many British Universities and Government Projects rely heavily on European Research Council funding grants to complete valuable research into medicine and science. At present findings and data are shared amongst those institutions in receipt of grants leading to a co-ordination of results and experiments throughout Europe. A hard Brexit would see access to these types of funds cut-off leaving many projects massively underfunded or unable to even get off the ground. A softer Brexit would allow grants to continue, but until the deal has been ratified there is a genuine concern amongst the academic community. Travel doesn’t just cover immigration. The Eurostar was a French and British funded project but if there is a “no deal” then trains may not be permitted to enter France according to the French Minister, Nathalie Loiseau. Air travel might also be affected and Ryan Air have already added a Brexit clause to any tickets dated after 29th March 2019, with British Airways yet to announce if they will do the same. 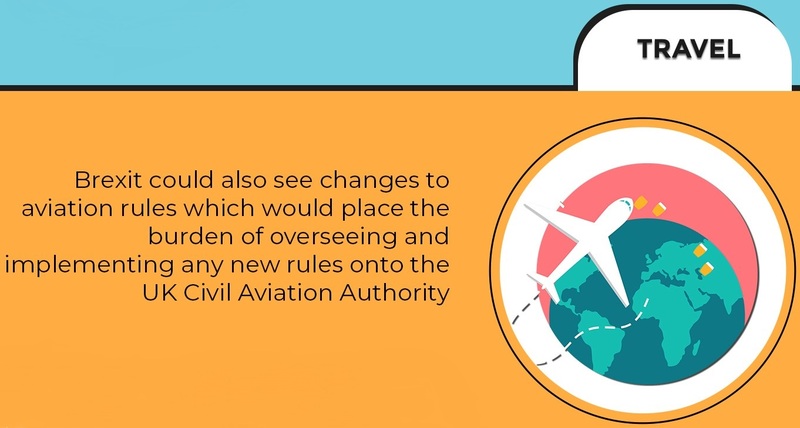 Brexit could also see changes to aviation rules which would place the burden of overseeing and implementing any new rules onto the UK Civil Aviation Authority. What does Europe Really Think? The heads of the European states are unimpressed with the decision to leave and have been accused of trying to make an example of the UK. The likes of Jean Claude Juncker are under no obligation to provide any illusion of security and sanctuary once Britain leaves the arms of the Union. At present the UK holds 10% of voting rights within the EU even though its only 1 of 27 countries. France and Germany will no doubt pick up some of those MEP seats, but it’s unclear where the remainder will be distributed and what the long-term effects of that will be. Michael Barnier is currently serving as the European Chief Negotiator for the Brexit talks and has dismissed the Chequers deal stating that “the bloc are ready for a “no deal” scenario”. If this stance is to be taken by Europe, then this may well leave the United Kingdom without a transition period and would likely cause economic chaos. A “no deal”, although a possible reality, is not the outcome either Europe or the UK would find beneficial. The lasting impact of Brexit on the UK economy remains to be seen in its entirety and will only be wholly understood once a deal or “no deal” outcome is reached in October 2018.